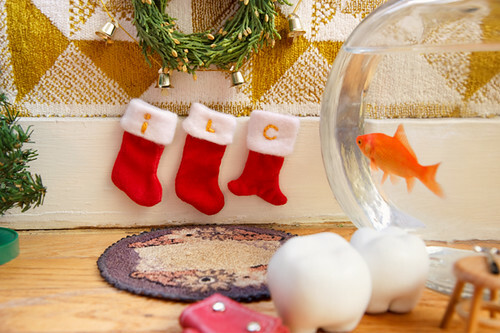 Their stockings could also be an acronym for "I Love Christmas"! And Carrot's stocking is the cutest. :) Merry Christmas to you and yours! LOL!! Carrot's Stocking is so cute!! LOVELY! Just lovely. So cute. Thanks for this Christmas post! you always make me smile :) thank you! So adorable :) Your posts always make my morning a good one! Oh my.. miss lardee & ickle badly, this is toooo cute!! Its really a pleasure to go through your posts every morning.The Christmas stockings are really cute...I must say!! Merry christmas ~ :D ! Why do I feel like they forget you ??? They're so adorable!! *^^* From now on I wanna have my own ickle and Lardee! Oh that is too cute! Made me laugh out loud : ] I love it! Adorable! Hope they enjoy their presents! :) Merry Christmas! All the very best to you this season and wishing you the happiest, healthiest New Year! Merry Christmas! So Charming – and FUN! You're back! Please can we have more ickle and Lardee in 2013? And Carrot, of course! On a rough day, nothing brings a smile like their shenanigans. You're amazing! First of all: I love your work. It's brilliant, unique, humorous, well-made and lovely. I'm huge fan of yours, keep it up! But can you finally answer all those people who keep asking you about Carrot's real condition? 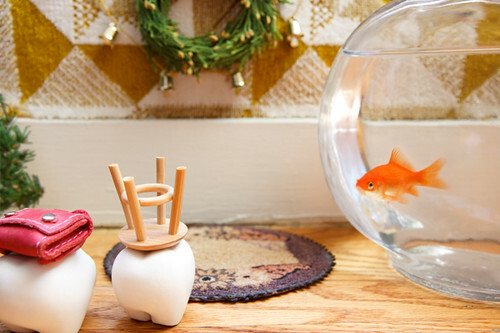 As you already know (if you read your fans comments) that little bowl is way too small to keep a goldfish in there. One goldfish needs at least 150 litres of water and an effective filter. What you do is animal cruelty and I can't accept it. So please, do a favor and get rid of Carrot or give him a better place to live! Je découvre votre page, et c'est vraiment formidable ce que vous faites. La mise en scène est géniale, et l'humour à croquer. Je la garde en favoris, j'adore votre imagination. Awww :3 Is like "I love carrot" you know initials. so carrot is now 4 years old or older, or its a different fish ?.